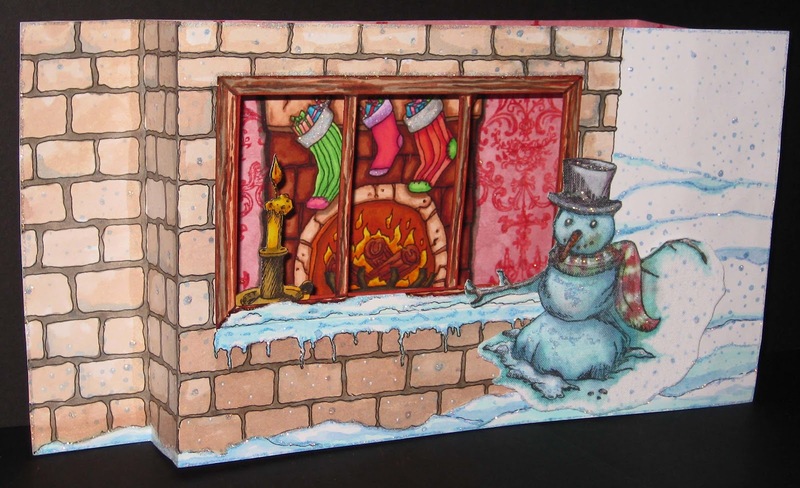 Velvet Paw Creations: Collapsible Diorama Christmas Card plus Fabric Stamping for Blockheads Paper Arts! 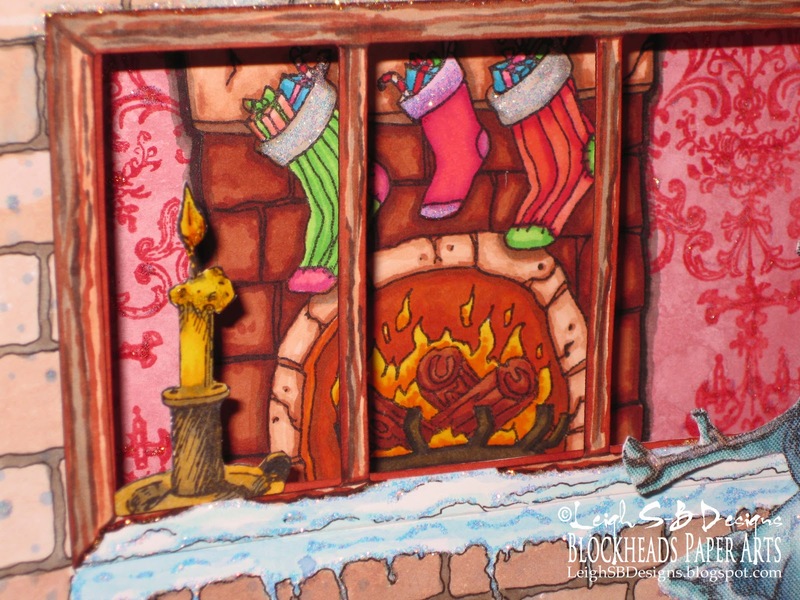 Collapsible Diorama Christmas Card plus Fabric Stamping for Blockheads Paper Arts! Can you believe there's only 166 days until Christmas!? It's my favourite time of year so personally I can't wait LOL! So you can imagine I'm having a ball with Christmas in July and I've got two cards I made this week to share ;0) Today I'm excited to show you the diorama Christmas card that I designed for Blockheads Paper Arts! It is collapsible so it will lie completely flat in an envelope so you can get the WOW factor and mailing convenience all in one great card! Here's two views of the cool diorama card from above, I love how it turned out! I also combined Blockheads' current Technique Challenge, Fabric Stamping, into my card! 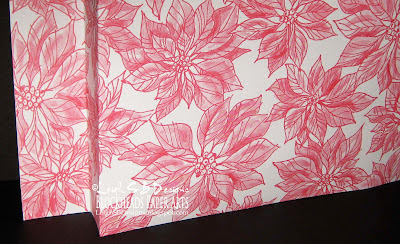 So before we get started I want to tell you about Blockheads Fabric Stamping Technique Challenge! We've made a little change to the challenge set up that will make it easier for you guys to participate! Before you were required to include the html blog hop code into your post, now you don't have to if you don't want to. Enter the Blog Hop Challenge for a chance to win a $25 gift certificate or submit your project to Blockheads Facebook group if you don't have a blog for a chance to win your choice of a 4" x 5" cling mounted stamp set! Visit Blockheads Fabric Stamping Technique page on their website and check out Karen's wonderful tutorial on how to go about stamping on fabric. Everything you need to know about entering the challenge is on that page. Then enter the challenge on the Blockheads Blog. I used two of Blockheads' fabulous Christmas stamp sets to create my diorama. The Fireplace is from Christmas Morning, the Snowman, Candle, Holly and Snowflake dots are from An Illustrated Christmas and the large Flourish design is from Feeling Regal. Let me show you the Fabric Stamping part of my project first. Stamp the Snowman onto a piece of white cotton fabric with Midnight Black VersaMagic ink and start painting with washes of Tsukineko All-Purpose Inks to create a watercolour effect. 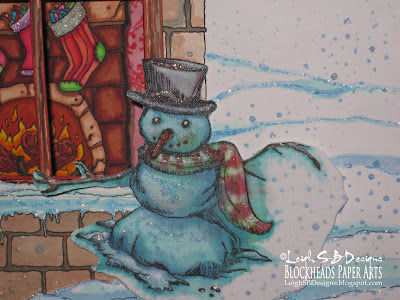 Dilute the ink with water and apply Mint Green to the background area around the Snowman with a paint brush. Add some Mint Green to the Snowman too. Add touches of Sky Mist to the whole Snowman and Ash Rose for rosy cheeks and tummy. Continue building up the Snowman with washes of Mint Green, Sky Mist with touches of Midnight to create a sense of depth. 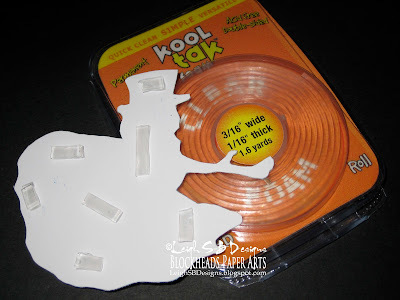 Use Cool Gray and Burgundy on his hat and Spring Green and Poppy Red on his scarf. I decided to use Copic markers to colour in two areas and used E15 to colour the twig arms and YR09 to colour his carrot nose. At this point you'll notice that the Snowman isn't white anymore so you could just leave more white areas while doing the washes or you can add highlights like I did instead. 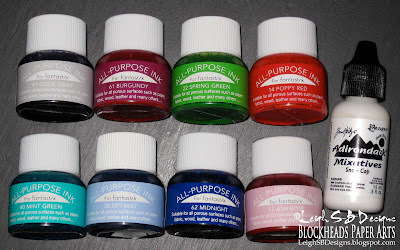 I don't have any White All Purpose ink so I could have used some acrylic paint but I had my bottle of Snow Cap Adirondack Mixative Alcohol Ink on my desk so I decided to try it and I was happy with the result! I used Snow Cap to paint white highlights on the entire Snowman including his hat, scarf, nose and arms as well as the snow. 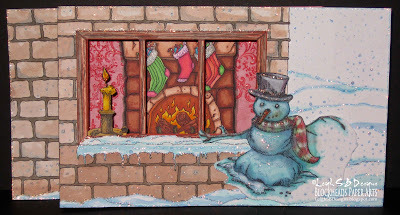 Puddle a diluted amount of Sky Mist onto the palette and ink up the Snowflake Dots stamp and randomly stamp falling snow all around the Snowman. Run a piece of heavy weight white cardstock through a Xyron to add permanent adhesive and adhere the fabric to it so that the Snowman has some nice weight to him and isn't all floppy! Add touches of Diamond Stickles Glitter glue for a wonderful magical sparkle and put aside to dry. 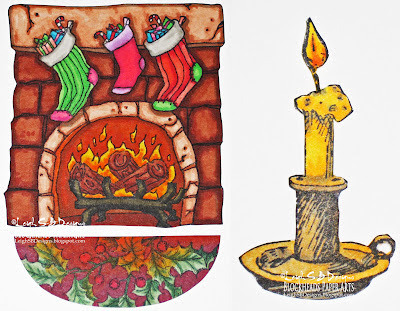 Stamp the Fireplace and Candle with Tuxedo Black Memento Ink on Neenah Solar White cardstock and colour with Copic markers. I also decided I needed a hearth rug to complete my indoor scene so cut the shape out of a scrap of Neenah cardstock and stamped the Holly and coloured it so it looks like the warm glow from the Fireplace is reflecting on it. 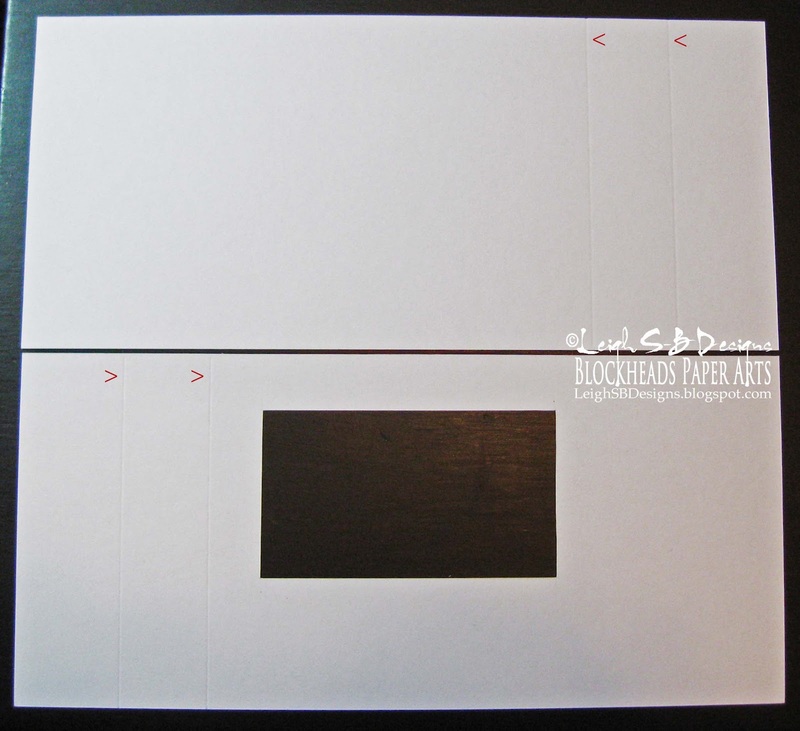 Once all the key elements of the card were done I knew what size to cut my white cardstock for the card panels. 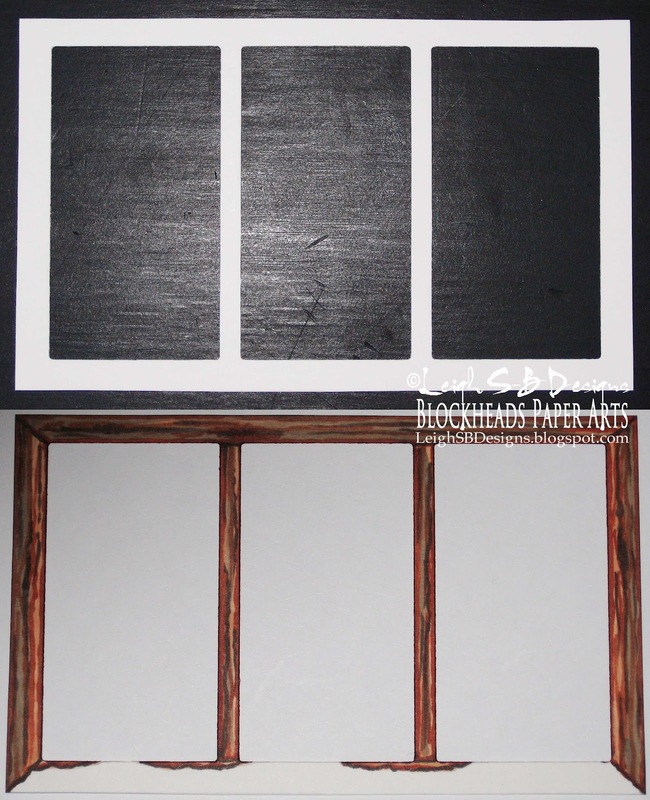 Cut a front and back panel and depending on how wide you want the diorama to be score two lines with a scoreboard into both pieces at the same time. Then just flip the back panel around so that the scored lines are on the opposite side. I've marked the score lines with little red arrows in the pic above. Cut a window into the front panel with either a die cut or a knife. The window is slightly smaller than the 3 window pane you see in the photo below. You'll see why in a minute. Die cut out a window pane with a Quickutz die. If you don't have a 3 window die then just use a single rectangle Spellbinders die for example to make the 3 cuts. Colour the window pane with a range of Earth Copics so that it looks like wood. Create a sense of perspective on the bottom edge by drawing in the angled lines and also leave some areas white for snow. I created the front panel of my card by drawing in the bricks for the house and added snow on the window ledge and snow on the ground with a black Copic Multiliner (Blockheads currently has the Multiliner set on sale)! All the bricks, snow and shadows where painted with washes of the All Purpose Inks. Stamp the Snowflake dots randomly all over the card front with Sky Mist API. 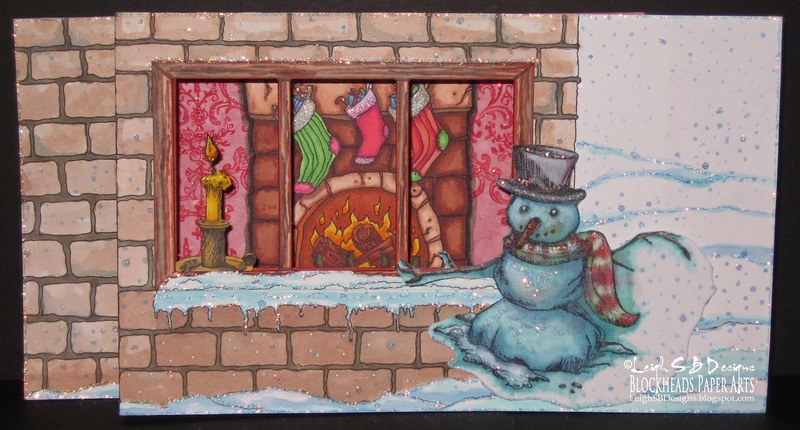 Add white highlights to some of the Snow dots with a White Marvy Le Plume pen or a white gel pen. 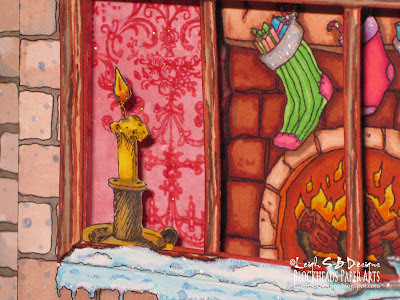 Colour the edges of the window cut out with a brown Copic and adhere the window pane to the card front with craft glue. Don't line it up exactly, have a portion of the window peeking out along the bottom edge and one side behind the window pane. This gives the impression that there's a wall and windowsill inside the house! But before you glue it down put the Candle between the two so it looks like the Candle is sitting on the windowsill. Embellish the snow, falling snow and the candle with touches of Diamond Stickles glitter glue and put aside to dry. Sponge a wash of Burgundy API all over the second panel making sure it's the 'inside' of the house and the score lines are down the right hand side (or whatever side you decide to go with). Create a wallpaper effect on the wall inside the house by stamping the large Flourish from Feeling Regal multiple times with Warm Red ColorBox Fluid Chalk ink. Fold all the scored lines on both panels and fold the panels together to determine the correct placement of the Fireplace. Adhere the Fireplace and rug with craft glue and add shadows with Copic markers. Embellish the wallpaper Flourishes and the Stockings with Diamond Glitter glue and put aside to dry. Run a sheet of decorative Christmas paper through a Xyron to add permanent adhesive, adhere the wallpaper panel to the back of it and trim away any excess. I plan to add a decorative label to the back of the card made with Spellbinders label dies for my stamped Christmas sentiment. In the photo above you can see there's two ways to fold the diorama flat for mailing! Either with the scored sections folded in to fit a smaller envelope or unfolded for longer envelopes. A closer look at the fabric Snowman. A closer look at the welcoming Candle in the window. And finally a closer look at the Christmasy Fireplace scene inside the house! 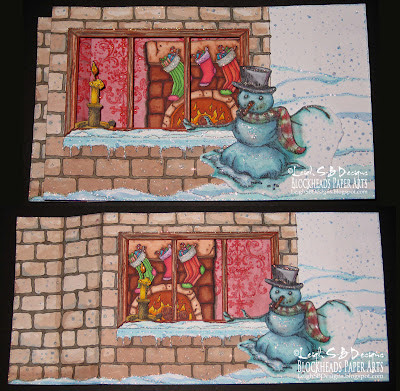 Thanks for visiting with me today, I hope you enjoyed checking out my Christmas Diorama card and come back again over the weekend to see my Third Coast Rubber Stamps Christmas card too! Gorgeous coloring. I love the 3-d construction. So pretty! Gorgeous creation, not seen one like this before! Its fab! Ho Ho Ho, just wonderful as I love the Chritmas snowy scene! 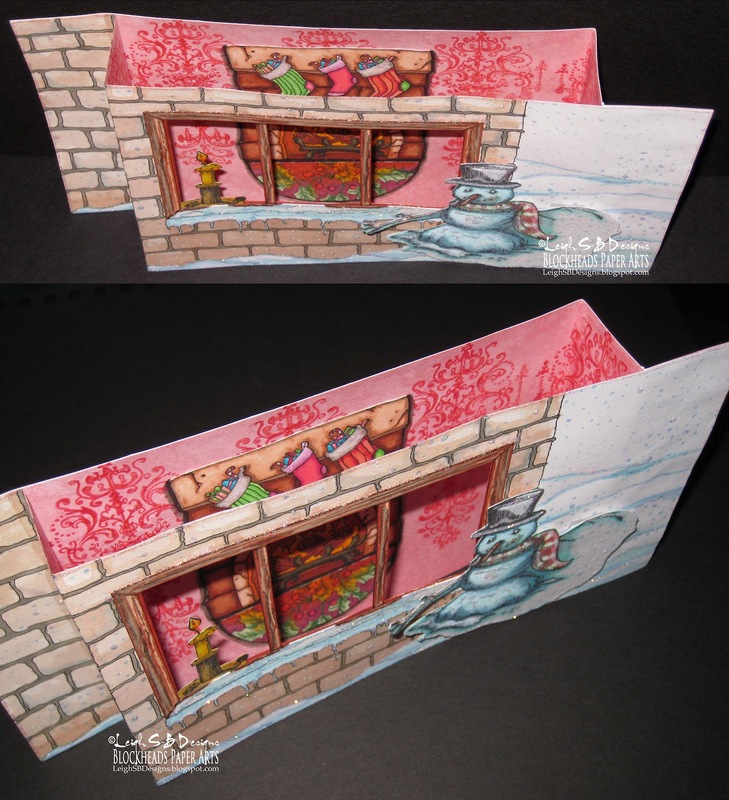 This diorama card project of yours is absolutely Fabulous -- I LOVE it! Love this card great Christmas card. I could just snuggle up in front of this fireplace!! Amazing coloring, Leigh!! WOW, what an amazing card, fabulous job! Thanks for playing at Twisted Tuesday Challenges this week! Great card...Thanks for joining us over at LRW! Wow! How cute and creative! Thank you for playing along with the Twisted Tuesday Challenge!